Set of 12 Cupcake cliparts for teachers, blogs, web pages, scrapbooking and more. 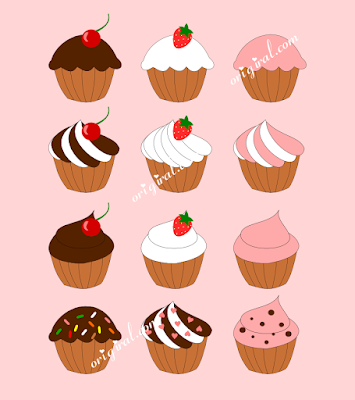 Cupcakes with cherry, Cupcakes with strawberry, chocolate cupcakes and vanilla cupcakes come to you in both high quality 300dpi PNG format with transparent background and also JPG format. Also includes a SVG format perfect for cutting machines. Each art piece is approx 5.55in on its longest side. The cute and adorable cupcakes found on OrigiRal are 100% original and created by Ral Vassileva. Your purchased art will be free of watermarks! Perfect for digital and perfect to print!